Can you remember the days when your mailbox use to be chock full of catalogs, letters and cards? Personally, my mailbox can go months without seeing something personal or fun inside. While receiving e-mails are certainly more eco-friendly and quick, it can't compare to the surprise of opening your mailbox to find a package or holding a handwritten card in your hands. 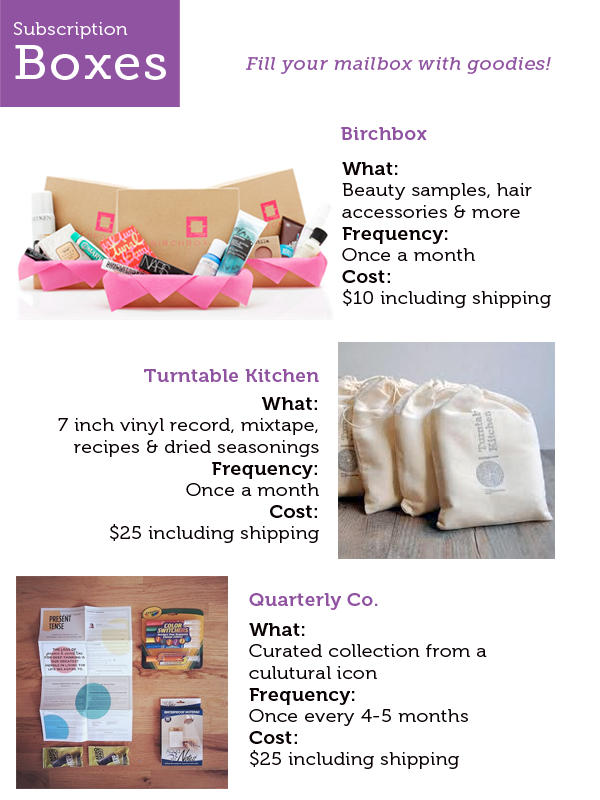 So being the mail-lover that I am, I was so excited to find out about subscription box sites and wanted to share! These boxes come usually about once a month and are filled with goodies. I signed up for Birchbox, it's $10 a month and you receive a box of fun samples and products. Later this month, my first box should arrive and I will definitely share what's inside! Would you sign up to receive a goodie box each month? Are you or have you received these kind of boxes in the past? What did you think?